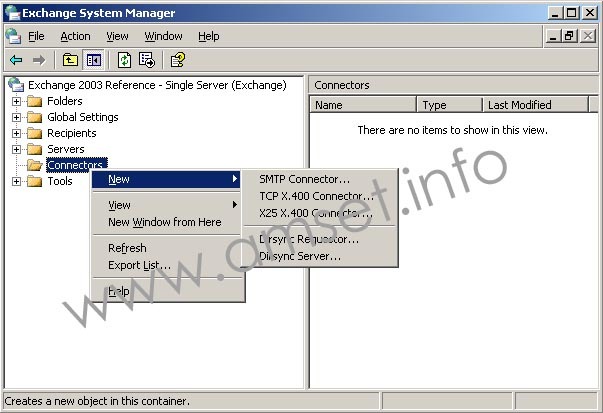 The SMTP Connector on Exchange is a powerful tool for an Exchange administrator. It allows you to make SMTP email work in the way that you want it to, instead of allowing Exchange to try and work it out for you. It can be used to send email via your ISPs email server - useful if you are on a DSL or dynamic IP connection. If you have a smart host - perhaps in your DMZ then an SMTP Connector can also be used for that. 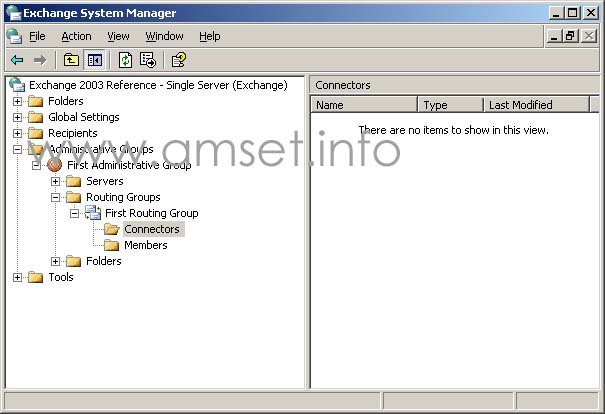 You can use the connector to allow your Exchange server to relay for another domain to another machine. Allow your Exchange to be used as a backup email server for another independent SMTP domain. An SMTP Connector plays no part in the delivery of email to mailboxes hosted on your Exchange server. Even in the "inbound" scenarios outlined above, the connector is being used to send the email to another server. SMTP connectors are not server specific. They are stored in the AD domain as part of the Exchange org. Therefore when you are moving to a new server or introducing additional servers you will not need to create additional connections, simply adjust the existing ones. 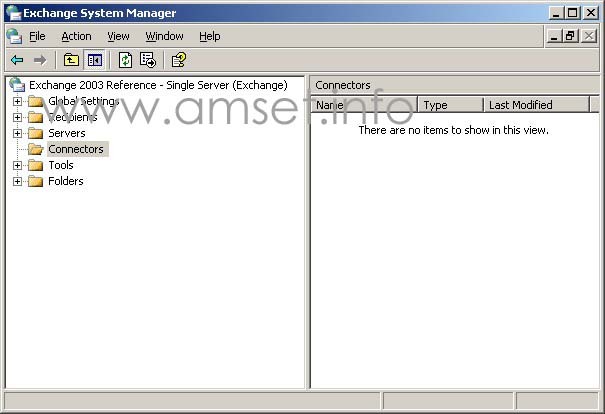 If you are co-existing with Exchange 2007, then an SMTP Connector will be seen by Exchange 2007 as a Send Connector that it cannot modify. Why use an SMTP Connector to Relay Outbound Email Through your ISP? It is now becoming quite common for some of the large ISPs such as AOL and many others to tighten the configuration of their email servers in an attempt to reduce the spam being sent. This has caused problems for many operators of Exchange servers as email from their servers are being rejected as well. If you are on DSL, or any kind of dynamic IP address, then you may be caught in this trap. If you are unable to fulfil AOL's or the other ISPs requirements, or need a solution quickly, then you can setup an SMTP connector on your Exchange server which will allow you to route email through your ISPs SMTP server. This server will pass AOL's tests and should work for any others that you are having problems with. You may find that you have to open Routing Groups, <Your Routing Group>, Connectors. Give it a name that allows you to easily identify what it is used for. For example if you are using the connector to relay outbound email through the ISP for certain domains then something like "Outbound - Problem Domains" makes it easily identifiable. If you are using it for inbound email, for a subdomain for example, then a good name might be "Inbound - sub.domain.com". If you are creating the connector to relay email to another external server then you could use a name like "Relay - domain.com" (where domain.com is the domain that you are relaying for). 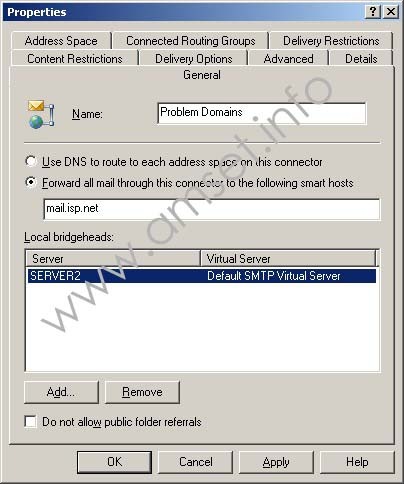 Enable the option "Forward all mail through this connector to the following smart host" and enter the mail server address of the SMTP server that you want to relay email to. If this is to your ISP, then it is the ISP information. Check you are using the right address for OUTBOUND email. If it is to relay to another server then the IP address is the best option. Using a DNS name might cause problems. If you are using IP addresses then enclose the addresses in [ ]. Click the "Add" button under "Local Bridgeheads" and choose your Exchange server. If you have more than one Exchange server enter that one as well. Don't enter any Front End servers you may have. Click on the "Address Space" tab. Click on "Add" and choose SMTP. For example, if you are having problems sending to AOL, then enter "aol.com" (minus the quotes), Hotmail, enter "hotmail.com" etc. If you want to route all outbound email through this connector - leave the * in place. Make sure that you leave the option "Allow messages to be relayed to these domains" DISABLED. If you don't then you have turned yourself in to an open relay. Remove the * from the address space tab. Enter the external domain that the other server is responsible for. If this is a subdomain of your main domain then enter subdomain.example.com - no @ or * or anything else. Enable the option "Allow Messages to be relayed to these domains". Remember that if you want your server to relay for a different domain to a different server then you need to configure a different connector for each server. Once you have the domains listed, leave everything else as default and click apply/ok to exit. If you have multiple connectors, especially a connector that has a * in the address space (for sending email via your ISP) then you need to adjust the cost carefully. The wildcard SMTP connector with the * should have the highest cost, SMTP Connectors pointing to internal servers should have the lowest (so that they are used first). If you want to load balance the connectors then you can set multiple connectors at a cost of 1. A: The display of Admin and Routing groups isn't enabled as default. You need to enable it by hand. Right click on your organisation name right at the top of ESM and choose Properties. Enable both boxes. Apply/OK and you should see the extra options. Q: What happens if I don't take the * out of "Address Space". A: All of your email is sent out via the ISP email server. While this isn't a problem, some people prefer to send most of their email direct. Q: How can I find my ISPs Smart Host? A: Look on their web site for their outbound SMTP server. Another good trick is to look for their instructions for Outlook Express. This will usually have their SMTP server listed. Otherwise you may have to call them to find out what it is. While you are on the phone, check whether you need to authenticate when sending only. Don't use the term smart host though, as it only confuses them. A: You need to add a username and password to the SMTP configuration. On the properties of the connector click on the "Advanced" tab. Click on the "Outbound Security" button. Change from anonymous to basic authentication. Click on the "Modify" button and enter the username and password as required. Q: Why not specify the smart host in the SMTP virtual server? A: While this option would work if you wanted to send all email out through the ISP email server it can cause problems. The key issue is if you have more than one Exchange server. Configuring a smart host on the SMTP virtual server breaks replication between the servers. Q: I already have a connector to send email through our front-end server/spam server. A: If you are using a third party server then you will need to look at the configuration to see how to direct email to another machine. If you already have a connector to route email through a front-end server then add the new connector as indicated above, but only add the Front-End server in "Local Bridgeheads". Q: Is this an alternative to getting reverse DNS configured? A: No - you should still get your ISP to make a reverse DNS entry for you if possible. This is good practise for a machine connected to the Internet. We have more information on configuring your DNS here. Q: How can I use a connector to bypass my ISPs block on SMTP traffic and use a third party SMTP Server? I don't see where I can set the port. A: If you need to use an alternative port for SMTP traffic, then adjust the SMTP virtual server first. Another option would be to create another SMTP virtual server, on the same IP address as your main server. Then change its port. Once set, change the SMTP virtual server being used as the bridgehead in the SMTP Connector. By using an additional SMTP virtual server you can leave the default on port 25, which is good for use with additional Exchange servers. Q: Can I use more than one SMTP Connector with the wildcard? A: If you have access to two SMTP servers that you can relay email through then you could add both on separate SMTP connectors. Both SMTP connectors would need to have the cost set as 1 and the address space as *. However you could also set both smart hosts on the same connector separated by a semi-colon (as indicated above). Q: Can I have a fail over configuration, so the second connector is only used if the first is not available? A: No, this is not possible. If you have two connectors, both with the address space set as * and the cost as 1 and then 2, Exchange will ignore the connector with a cost of 2. The most you can do is load balance, with the same cost of 1 on both connectors.